Going gluten-free usually means eating foods that are mostly made from corn, rice, quinoa, buckwheat, and sometimes gluten-free oats. The problem is, gluten-free breads, snacks, cakes, pizza, and other grain-flour foods are still loaded with glucose. It doesn’t matter that they lack gluten—they are still high carbohydrate foods that digest into vast amounts of glucose that will raise your blood sugar—and this is precisely what you do not want if you have diabetes or cancer. If you have diabetes or cancer, or both of these, I suggest strongly that you eliminate grains as much as possible from your diet. Wheat, barley, rye, oats, corn, rice, and even grains like buckwheat and quinoa—and flours made from any of these grains—contain large amounts of glucose molecules that will increase your blood sugar. If you have diabetes, eating foods that increase your blood sugar will not help you reverse your diabetes. If you have cancer, eating foods that increase your blood sugar can act as a fuel that helps cancer cells multiply. Take a look at this short video that I have made on this topic. 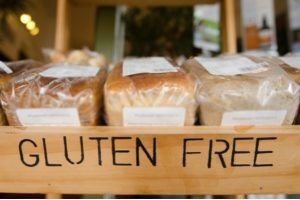 During the holiday season, if you are tempted to eat gluten-free, think that this is not a solution for a diabetic person or someone with cancer. Sometimes books make the best gift. Why not give life-saving knowledge to a loved one this holiday season?